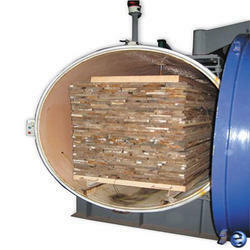 Pioneers in the industry, we offer wood dryer from India. We are leading manufacturer and exporter of Wood Dryer and our product is made up of good quality. Among the many interesting topics in the field of Wood Dryer Science and Technology is a fascinating story about research and development on drying wood products with high-frequency electric current. Historically, it can be traced back over decades. Heat transfer to and evaporation of moisture from wood may be accomplished with high frequency current depending on its dielectric properties. Because wood is generally heterogeneous, these properties vary not only with the frequency of the current and the field orientation, but also with the moisture content, temperature, and density of wood. Considering these parameters and the specific heat of the material, estimates of power absorption can be made. Heating by high frequency current and drying in vacuum where the boiling point of water is decreased with decreasing pressure. Consequently, the movement of water through wood increases leading to shorter drying times than can be achieved at atmospheric pressure. The intensity of the heating depends directly on the moisture content of the wood and the electric field, while the moisture movement depends on the permeability of the wood and the internal pressure gradient. At radio frequencies, the penetration depth influences the dimensions of the electric field that is of the order of meters, thus, making possible the heating of entire stacks of lumber. Looking for Wood Dryer ?